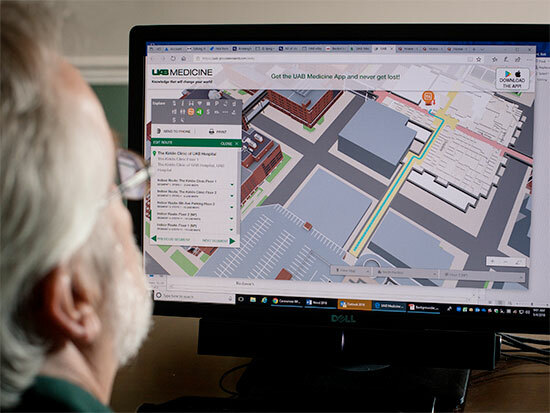 A patient looks up directions using Wayfinder on a desktop computer.Finding your way to your doctor’s office at UAB Medicine just got easier. So did finding your way to the parking lot, the coffee shop and the restaurant across the street. 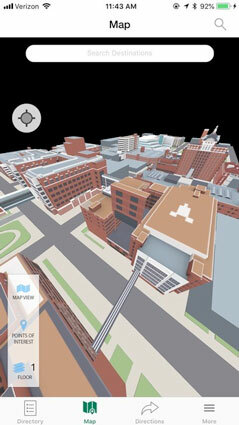 Introducing UAB Medicine Wayfinder, the UAB Medicine wayfinding app, available on mobile devices and as a web version for desktop use. UAB Medicine Wayfinder, using the MediNavTM Navigator Edition 2.0 wayfinding system from Connexient, makes finding and reaching locations in and around the UAB Medicine campus much easier. This free app provides step-by-step directions with functionality similar to Google Maps, enabling patients and their families, guests, and staff to reach destinations with ease and reliability, anywhere on the medical campus. UAB Medicine Wayfinder is available in a mobile version for both iOS and Android devices, as well as a web version for desktop use. Within the medical campus, only a Bluetooth connection is needed to use the app. The desktop version provides the capability to print paper directions. The app is available at the App Store by searching for UAB Medicine Wayfinder, or click on UAB Medicine’s Wayfinder page. A video demonstrating the app is available.